Using a lightsaber as a flashlight is a bad idea, given you can easily lop someone’s arm off while flailing around in the dark. 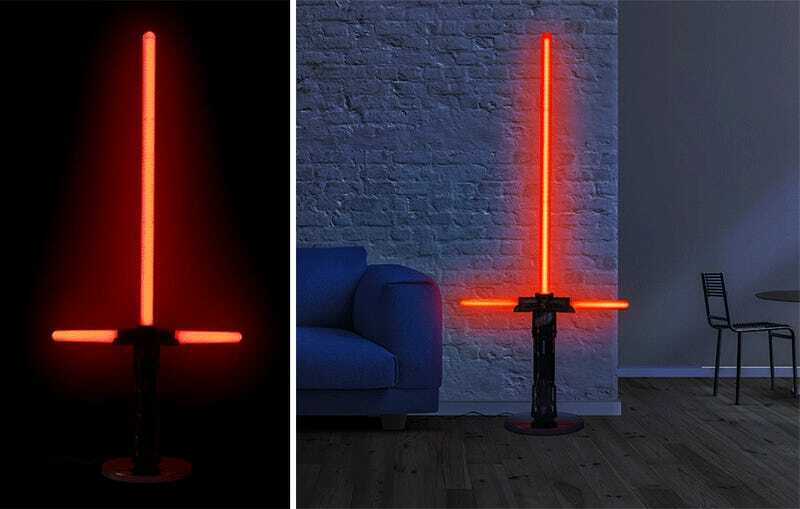 But ThinkGeek’s new five-and-a-half-foot tall lightsaber floor lamp is a much safer way to find your way around in the dark, since it only relies on LEDs to glow. There are actually two versions of the lamp available; one modeled after Kylo Ren’s lightsaber, and one after Darth Vader’s. But it’s the former, with its red glowing cross-blade, that we’d rather drop $160 on. You don’t even need to have the Force to activate from across a room, just the ability to remember where you left its tiny wireless remote. Is there anything a lightsaber can't do?